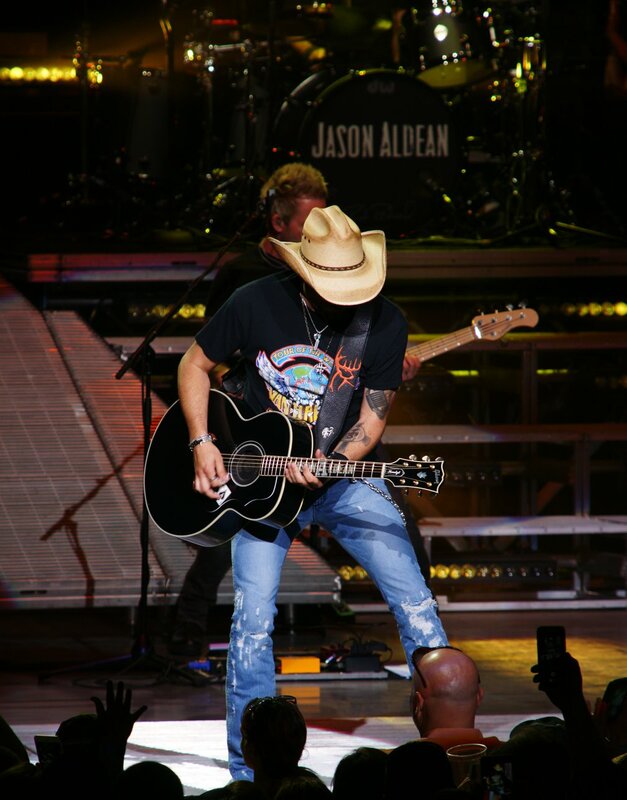 Jason Aldean’s High Noon Neon Tour Kicks Off Summer 2018! 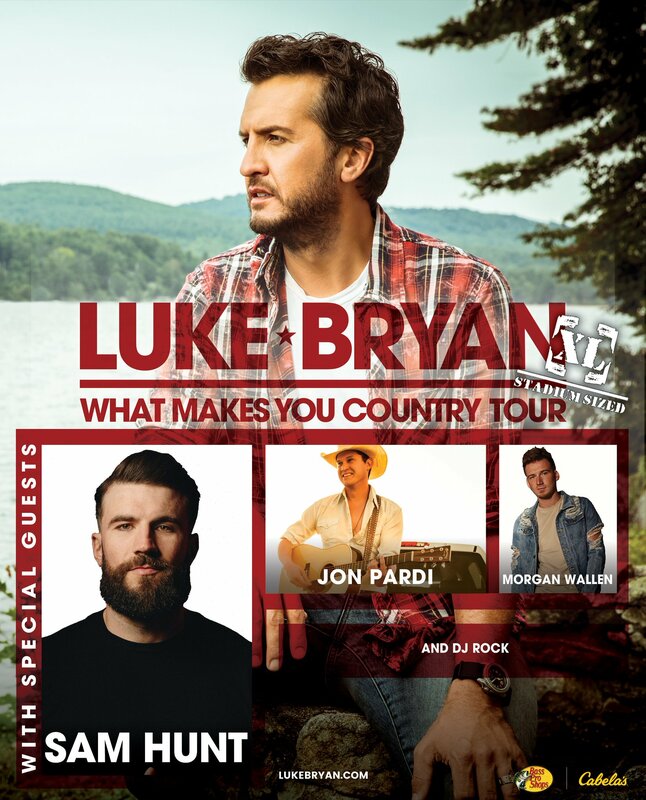 Summer 2018 officially started on Saturday May 26th with the first country concert of the season at the Xfinity Center in Mansfield, MA. 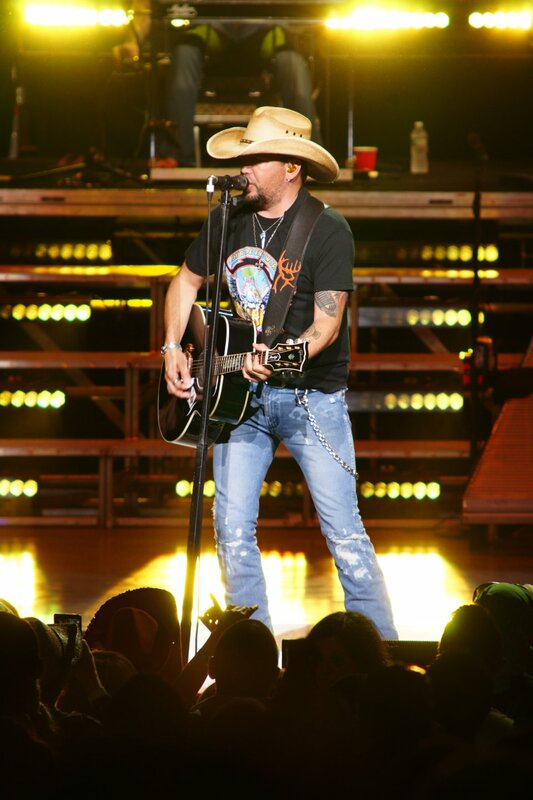 Jason Aldean kicked it all off off with his High Noon Neon Tour, featuring openers Lauren Alaina and Luke Combs. The energetic DeeJay Silver kept the tunes pumping in between sets. It was a beautifully warm night, just perfect for the outdoor venue. The crowd gathered early and waited with beer in hand for the show to begin. As the sun began to fade, the heat of the day was replaced with a soft, cool breeze. Promptly at 7:35, Lauren Alaina took the stage and belted out an oldie but goodie, ‘Georgia Peaches.’ It was released back in October of 2011 as the second single from her debut album ‘Wildflower.’ She really got the crowd going as she rocked out, flipping her hair back and forth, to her second song of the night, a cover of the Guns N Roses classic, ‘Paradise City.’ Now that the crowd was warmed up, she invited a special guest to join her on stage and dance with her to ‘Next Boyfriend.’ She asked the audience: “So who wants to see what he’s got?” The special guest and showed off some stellar moves up there, including the whip/nae nae! It was a fun performance! Alaina next asked the audience: “Who has a crazy family?” She described her own family situation, mentioning how her dad was a heavy drinker and this past October 6th was his 5th year anniversary of being sober. She really made herself vulnerable and talked about her parents divorce. This all led up to her performing her hit, ‘Doing Fine.’ She was really engaged with the audience during this song, reaching out to shake hands and even giving a few far reaching hugs! After physically connecting with people in the pit, Alaina went on to talk about the travelling that she’s been doing for the last seven years. “I missed my nephew’s birthday parties, I missed going to church on Sundays. There was a time that I thought this wasn’t going to happen.” She proudly introduced her next song ‘Three.’ Showcasing her talents as a true musician, Alaina played the piano for the beginning portion. Though Kane Brown, her middle school chorus classmate, wasn’t there to join in, she played their hit song ‘What Ifs.’ After, she thanked the audience for their support over the years, then mentioned that “I got second place on American Idol back when I was only fifteen years old,” and spoke about “how people are not always nice.” “I had an eating disorder for six years.” It was during this time in her life that she wrote ‘Road Less Traveled’ and she decided to conclude her portion of the show with this one. But just before it began, she said “A little girl’s daddy wrote me a note asking if his daughter can come up on stage with me. I don’t normally do this…” She then invited an adorable young guest out with her to conclude the set. The crowd had their cellphone flashlights on, swaying to the music. Lauren Alaina really engaged the crowd and we were all ready for Luke Combs to take the stage! 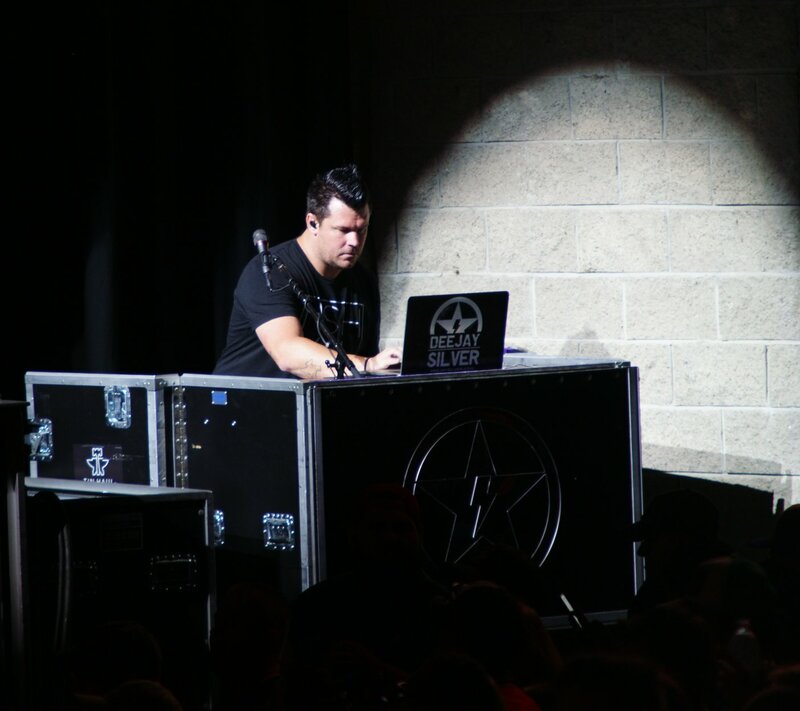 During the set change, Dee Jay Silver kept the crowd up on their feet with country jams like Sam Hunt’s ‘Body Like a Back Road’ and Luke Bryan’s ‘Country Girl’ mixed with other classic and contemporary pop hits. 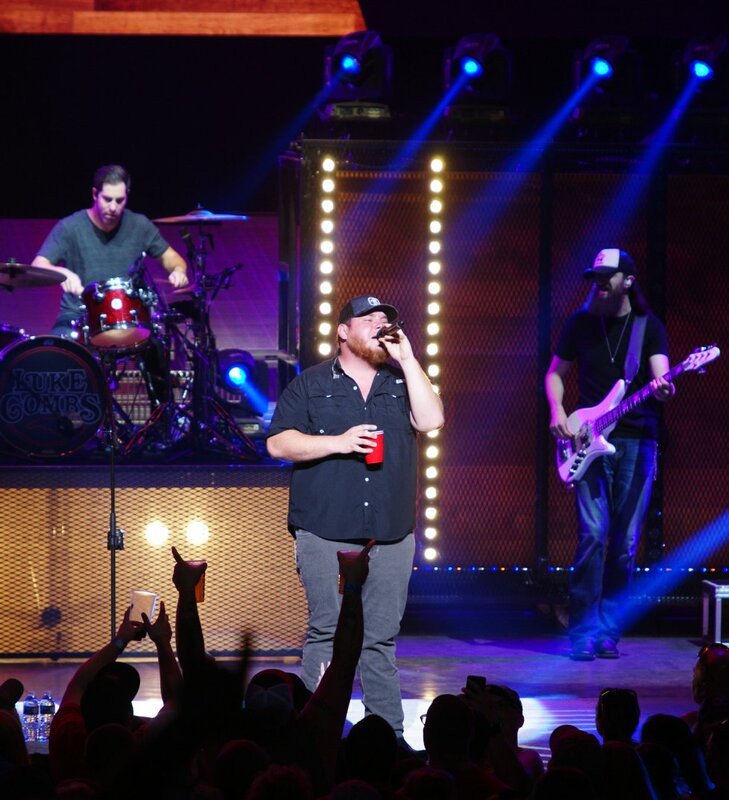 Luke Combs walked out on the stage with an iconic red solo cup in hand. He asked the crowd: “How you guys doin’ on this Memorial Day weekend?” And opened his set with ‘Beer Never Broke My Heart.’ He geared up for song number two by saying: “I started this seven years ago. I never imagined I’d be opening for Jason Aldean. This is one of the first songs I wrote back in North Carolina.” – ‘She Got The Best of Me.’ He then played ‘Don’t Tempt Me With a Good Time.’ Offering a little advice, Combs said: “You only got one shot. If you want to do something, Do it! A lot of people told me I have to grow up and get a real job.” Introducing his next song, Combs explained: “We’ve been on the road for four years. That’s how I came up with the idea for this next song.” – ‘Honky Tonk Highway.’ He ended this tune with a bit of ‘Boot Scootin’ Boogie,’ a real crowd pleaser. Addressing the audience once again, Combs questioned: “How many of you have broken up with somebody and it ended up being the best thing that ever happened to you? Me too! That’s what this next song is about.” He played his hit ‘When It Rains It Pours’ and the crowd loved every moment! Singing, dancing, and drinking it all up! The electric guitarist jammed along with his American flag/red, white, and blue painted guitar! He continued with ‘Beautiful Crazy.’ Then mentioned: “North Carolina is my home state. Anybody here in Mansfield know anything about country music?” He then played a classic country medley of ‘Take it Easy/Should’ve Been a Cowboy/Chasin’ That Neon Rainbow.’ Combs also performed, ‘One Number Away,’ the third single from his debut studio album, ‘This One’s for You.’ With his signature black Gibson in hand, he rocked out to ‘Can I Get an Outlaw.’ Addressing the audience one last time, Combs said: “I have one more song for you guys. This is the song that changed my life.” Then he sang ‘Hurricane.’ Everyone was singing along. Before the lights went out, he threw his guitar pics into the crowd! Slowing things down again he played the classic ‘Fly Over States.’ Then cranked things up with ‘Lights Come On.’ He next said: “This is one of my favorite songs from my new album and title track,” and played ‘Rearview Town.’ The crowd put their hands together to ‘When She Says Baby.’ Aldean toasted the crowd by saying: “Well we’re kinda celebrating a little bit tonight. And I know people in Boston like to drink and I hate to see people drinking alone so what I’m saying is that I’m about to start drinking with you guys if that’s alright. I do want to say a toast to you guys- First of all thank you so much Boston for always welcoming this kid from Georgia to come up here and play for you guys! Number two, this year we just had a big song on country radio thanks to you guys this thing spent two weeks at number one. And I’m pretty sure it’s become the wedding song of the year. People getting married to this thing, people making babies to this thing. There are gonna be some babies made tonight when you guys get home form the show. All I gotta say to that is you’re welcome! But seriously, here’s to you Boston, we love you. Thank you for having us!” Then he played his hit ‘You make it Easy.’ After saying: “I had a feeling you guys came here to party tonight,” Aldean kept the party going strong by playing “The Only Way I Know,’ ‘Dirt Road Anthem’, ‘Big Green Tractor,’ ‘My Kinda Party,’ and ‘She’s Country.’ He ended the night with ‘Burning it Down’ and ‘Hick Town.’ The energy level was through the roof and the crowd just didn’t want the show to end! It was an epic performance! Memorial Day weekend was off to a great start for the concertgoers. 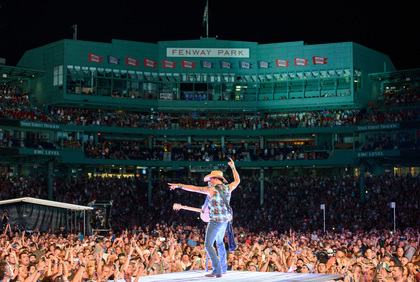 This show certainly set the bar high for the country concert season. Cheers to summer 2018! To see more photos from this show, click here. 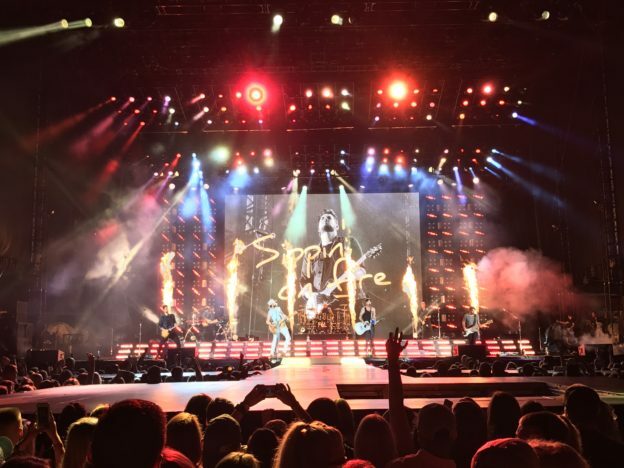 This entry was posted in Home page blog, Recaps and tagged Dee Jay Silver, High Noon Neon Tour, Jason Aldean, Lauren Alaina, Luke Combs, Xfinity center on June 12, 2018 by BeckyNECM. ‘Gettin’ Warmed Up’ is the third single that Jason Aldean has released from his upcoming album, ‘Rearview Town.‘ The rest of the album is set to be released on April 13th. 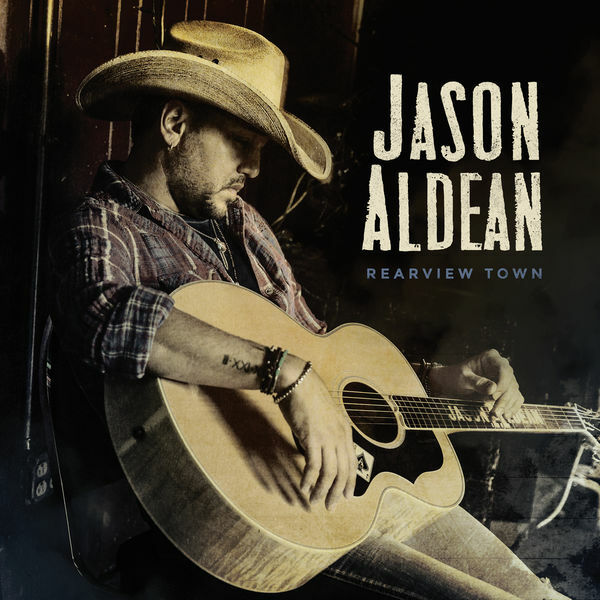 With the recent release of singles ‘Rearview Town’ and ‘You Make it Easy,’ two slower and more sentimental songs, it was only a matter of time before Jason revealed something from this album that will get fans pumped up. ‘Gettin’ Warmed Up’ is exactly that. It is the perfect song for a pregame, tailgate, or drive to a party. The opening rock instrumental of this song hits hard; with electrifying guitar and pounding drums, it does not let up. The song’s high energy is infectious. ‘Gettin’ Warmed Up’ presents not only a cross between country and rock, but also includes some rap for a mix that only Jason Aldean can pull off. Yes, you did read that correctly, country, rock, and rap. Jason Aldean is back to rapping in this song, similar to what he put forth in his previous hit, ‘Dirt Road Anthem.’ The country superstar raps a single verse; Gettin’ warmed up and gettin’ started, Everybody in here came to party, You need a good time, well I brought it, Hands up in the air if you want it, Yeah the speakers are here and they turned up, Cups filling, we mixed up the good stuff, Who’s setting it off, you know that’s us, Y’already know we gettin’ warmed up. ‘Gettin’ Warmed Up’ paints a simple picture of a fun night of partying that just does not stop. The lyrics, We showed up here when the sun went down, Hit it hard, kicked it off right, You think by now we’d be heading out, Hanging it up and calling it a night, But we’re just getting warmed up, open the song. Whether played as an opener or a mid-set song, ‘Gettin’ Warmed Up’ is sure to get the crowd going during a show. With buzz words like fired up and hands up in the air included throughout the song, it would seem that songwriters Josh Mirenda, Jaron Boyer, and Cole Taylor perfectly crafted the song for a Jason Aldean concert. Perhaps the single seems to fit so well into Jason’s repertoire because of the similarities it has with his previous hit ‘Just Gettin’ Started;’ even the titles are very similar. ‘Gettin Warmed Up’ also features the lyrics just gettin’ started in its chorus. The similarities of the songs go deeper, with both having themes about having a great time. It is intuitive to picture Aldean performing with some pyrotechnics bursting in the background while fans go wild for this song. It would not be a surprise to see the catchy single become a summer party anthem. You have options if you are looking to catch Jason Aldean on his upcoming High Noon Neon tour with Luke Combs and Lauren Alaina. 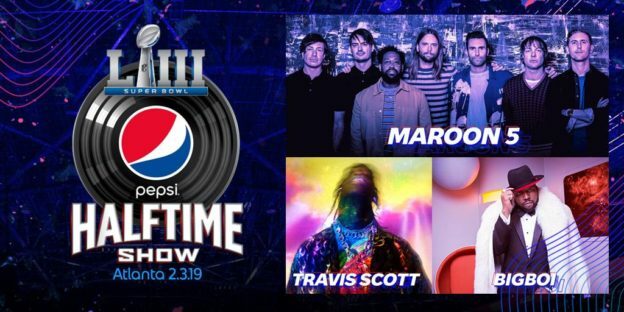 He will be performing in New England on May 25th at the XFINITY Theatre in Hartford, CT; May 26th at the XFINITY Center in Mansfield, MA; and May 27th at Darling’s Waterfront Pavillion in Bangor, ME. You can purchase ‘Gettin’ Warmed Up’ on iTunes, and keep up with everything Jason Aldean on his Website, Facebook, Instagram, or Twitter. This entry was posted in Home page blog, Reviews and tagged Gettin' Warmed Up, Jason Aldean, NECM, New England Country Music on April 5, 2018 by AlissaNECM.